The Rock continues to cash in with his latest blockbuster, Die Hard Skyscraper. 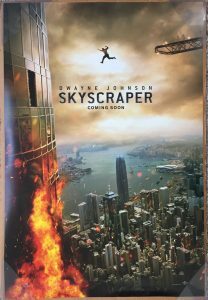 Written and directed by Rawson Marshall Thurber (Dodgeball, We’re the Millers, Central Intelligence), Skyscraper sees The Rock defy the odds to save his family who are trapped above the fire line in the biggest skyscraper in the world. Dwayne Johnson stars as Will Sawyer, a former FBI agent who lost his leg a decade earlier, meeting his wife, Sarah (Neve Campbell), a combat surgeon, in the process. Now with two kids, Georgia (McKenna Roberts) and Henry (Noah Cottrell), Will has settled into a seemingly safer occupation as a security consultant. He is hired by developer, Zhao Long Ji (Chin Han) to carry out safety checks on The Pearl, located in Hong Kong. Boasting a shopping mall, a vertical garden that we don’t really get to see other than when it’s on fire, and residential suites, it also features a tourist spot on its top level that Li compares to heaven. At three times the size of the Empire State Building, what could go wrong? It gets violent fairly early on when The Rock and an adversary go at it in a kitchen – The Rock’s WWE skills readily apparent. From then on there’s plenty of action – explosions, shoot-outs, dangling off buildings, The Rock defying death about 400 times. If it’s high octane thrills with an inevitable conclusion you’re after, you have found it. It also goes without saying that The Rock makes any film like this better by his sheer presence. Of course being 2018, you can’t just have a man rescue his wife and kids by himself. Sarah kicks a little bit of arse too, and kudos to Thurber for giving her something other than the damsel in distress role. Unfortunately there’s a terrible set-up early on for a final joke that’s basically “Oh look! A woman can use technology!” And not in a cool women in STEM way, in literally the most easiest and obvious way possible. Skyscraper isn’t worth seeing for the action alone. It’s worth it for the comedy. Whether that’s The Rock successfully making an impossible leap from a crane into the building (see poster/trailer/the memes), his son having an asthma attack and then being fine for five seconds while he shouts clear instructions to his sister before returning to near death, The Rock just casually holding up a bridge while his wife runs across and back in heels, or the inevitable “We will rebuild” moment, there are plenty of laughs to be had. Add to that some further corny dialogue and The Rock’s “YOU MESS WITH MY FAMILY, YOU MESS WITH ME” face, and you’ve got yourself one of the funniest films of the year so far. It seems that The Rock’s disaster films do aim to take the piss out of themselves, but it’s not always clear whether that’s intentional. Either way, I’m all for it. Go for the laughs. This review was first published on 12th July 2018 at Film Blerg.